Not all of us are blessed with living close to a fantastic walking spot. Let’s take us for example… we live in a lovely village with a lot of open countryside around us, but unfortunately it is not very dog friendly. The soil is predominately clay and arable land which in this current weather makes dog walks a real nightmare… ok, maybe the walks aren’t so bad by themselves but cleaning eight paws afterwards is! 30 minutes of walk and then an hour of cleaning, twice a day… this doesn’t sound very appealing to me. So, often we will drive them to a nice walking spot… most days it is just a short distance up the road so we can have fun on the local football ground which at least has some grass coverage. This is our everyday walk routine… but every so often we all want a change of scenery so we go for a longer drive to the local woods and make a day out of it. Sykes Cottages created a fantastic website Take The Lead, which is a guide to a great dog walks. So far they feature the Lake District, Norfolk and around the South West. Each of these areas has two dog walking trails. 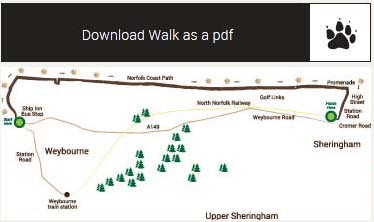 As Norfolk is closest to us let me focus on my favourite pick from this selection – the Weybourn to Sharingham walk. As you can see from the pictures the walks are described from the dogs point of view, which I like a lot; so different and totally adorable. 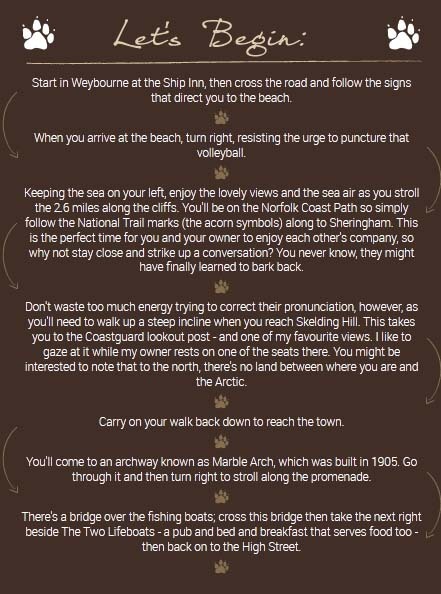 The trail description gives clear instructions on where to go and what you can see during your travels. If you want you can also download the walk in a .pdf file. Do you have your favourite walking spots? Do you like the idea of a website featuring countrywide best dog walking routes? Would you like to add your walk trail onto it? Great idea – we don’t have a dog but I will pass this on to my extended family members who do. Ahh lovely idea. I don’t have a dog but grew up with dogs in the house and this is really useful. A brilliant idea for dogwalkers – especially if you are on holiday and not sure of where to walk the dogs. I love this! We have a few country parks that are good for walks and Delamere Forest is close by. What a fab idea for a website! The views from the walks look amazing! Great idea for a site. I live in a brilliant area for walking, 50 acres of managed parkland, so natural surrouondings, but fabby man-made paths. However, it gets a bit samey, so I think a website like this is a great idea! Great idea for people with dogs. We are lucky in that we have some great places to walk dogs, but this sounds such a great idea. I am sorry for being nosy but… what type of dog did you get? We barely get to take our dogs anywhere people get very intimidated by german sheperds and so if the beach is not quiet we try to take them to a forest with a stream nearby in the summer but rarely for long as its usually busy. Oh, how I miss having a dog… It’s been years since I had a dog, and I don’t see having a new one anywhere in my future, but I do miss it. Lovely post, that really tugged on my heart.